Campbells Vegetable Soup 1954 Ad. 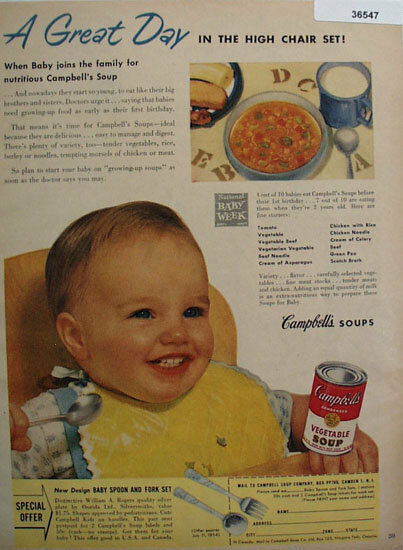 This color May, 1954 ad states A great day in the high chair set, when baby joins the family for nutritious Campbells Soup. Picture shows baby in high chair holding spoon, he has a big smile. Magazine tear sheet picture is taken through plastic and may show wrinkles or crookedness that is not in the ad. This Original magazine tear sheet measures 8 inches wide by 11 inches tall. Items Similar To "Campbells Vegetable Soup 1954 Ad"